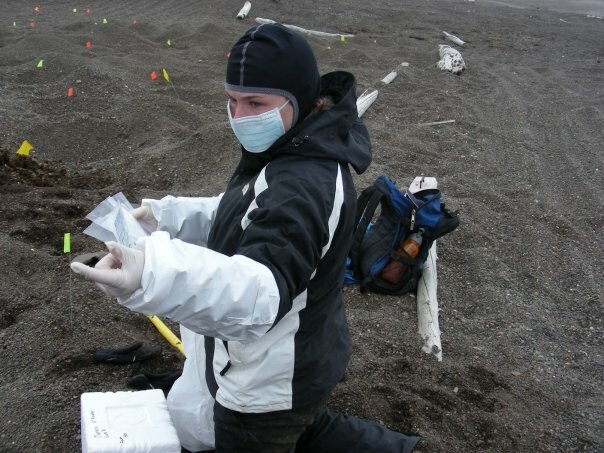 Excavating a cemetery in Barrow, AK. One of the best crews I’ve ever been on. This is one of those rare cases where I don’t need to recap the findings of the article, because the authors have published it in an open-access journal (PLOS ONE), and so I encourage you to go read the study itself here, and the Science news report about it by Ann Gibbons here. Fieldwork is an occasional, but very important part of my job, and from my experiences I can attest that junior people in the field, particularly students, are extremely vulnerable. I applaud these researchers for calling attention to this problem, and I hope that it will be the beginning of a very important conversation about how to make fieldwork safer for everyone. *** UPDATE: This piece, by Andrew David Thaler, is a must-read. I’d been debating about whether to write about the Richard Feynman controversy going on in the last few days, but instead I’ll just recommend that you check out the links in the first paragraph, particularly to Matthew Francis’ post on the subject. You may wonder why there aren’t more women in science. When universities are more likely to hire a man than a woman (despite equal qualifications) for a faculty position…. The problem of female participation in science isn’t exactly a new subject, and there’s not much I can add to the ongoing discussion, except to say that I believe one of the ways to encourage young women to feel comfortable pursuing a career in the sciences is simply to increase the visibility of women scientists. In this blog I intend to make a special effort to highlight the work of contemporary research done by my female colleagues (For example, I encourage you all to read my post on the interesting work of Dr. Charla Marshall.). But I also want to discuss the contributions of women throughout the history of science. Today’s post is a happy result of boredom. Over the past weekend I was doing a lot of DNA sequence analysis, which can be extremely tedious process. To keep myself awake and motivated, I’ve been working from home, where I can stream Netflix shows in the background. And after finishing “House of Cards” for probably the fifth time (I seriously love that show), I went on a “Cosmos” bender. I thought about writing a separate post about how much I adore this series, but really….just watch it for yourself. The effects may be a little dated, but Carl Sagan is an absolute joy to watch. At one point Sagan spoke movingly and eloquently about Hypatia of Alexandria, a woman I had never heard of before. (This is not necessarily due to a lack of visibility–much has been written about her–but simply my own ignorance). His obvious awe of her made me curious, and so I did some reading. I think this Muse from the Field Museum is an appropriate symbolic image of Hypatia. I learned that Hypatia was a remarkable woman. Living in Egypt sometime between AD 350–370-415, she was a Neoplatonic philosopher (in fact, she was the head of the Platonist school at Alexandria). She was a teacher and public lecturer of mathematics and science, in the traditions of the times (which emphasized logic over empiricism). Although none of her solely-published works are known to have survived to the present day, secondary sources describe her research on mathematics and astronomy, and she is known to have co-authored some of the writings of her father, the philosopher Theon Alexandricus. Contemporary accounts spoke of her as a brilliant and charismatic woman, and Hypatia’s accomplishments made her both visible and threatening. She was murdered by a Christian mob during a period of great conflict and political tension between Christians, Jews and pagans in the city, possibly either torn apart or skinned with oyster shells. Hypatia was therefore a martyr of science in a very literal sense. I’m sad that I’d never heard of her before now, and I can’t help but wonder whether young women who are interested in science and mathematics learn about her alongside the worthy, but inevitable Marie Curie*. *Who was a fine scientist, but seems to be the only woman in science that most people remember. In 1941, an archaeologist named Glenn Black excavated a site called Angel Mounds just east of Evansville Indiana. Angel Mounds (AD1050-1400) belonged to the Mississippian culture, which was found throughout the Midwest and Southeast in the centuries just prior to European contact. From Marshall et al. 2011, figure 2, showing the burial position of the two children. Note that this is not a photograph but rather a sketch image. While it’s important to show the disposition of the skeletal elements in order to illustrate the scientific background, out of respect for descendent communities I (and others) feel it is inappropriate to post actual photographs of human remains without permission. He interpreted this burial as “flesh-joined” twins, as they didn’t have any fused skeletal elements. Conjoined twinning* occurs when a single fertilized egg splits only partially into two fetuses (as opposed to complete splitting in monozygotic twins). The rate of conjoined twinning in the United States is approximately 1/ 33,000-165,000 births, but the frequency of conjoined twinning in ancient societies is unknown. The children’s remains, along with those of other people excavated from Angel, were taken to be cared for by the Glenn A. Black Laboratory of Archaeology at Indiana University, Bloomington. 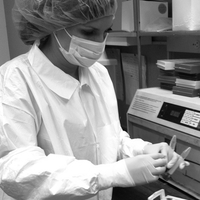 Dr. Charla Marshall, doing ancient DNA work. Note the protective clothing designed to minimize risk of contamination from modern DNA. 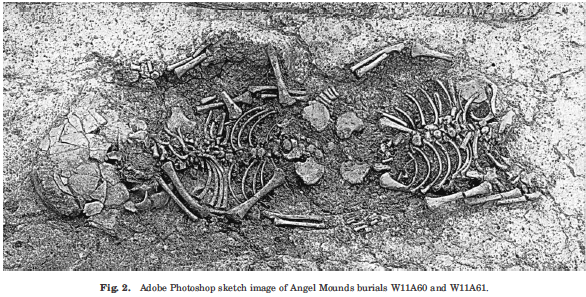 She and her colleagues found that the two children (designated W11A60 and W11A61) were approximately 3 months old, and had evidence for poor health, but otherwise saw no skeletal evidence that could either support or reject the hypothesis that they were conjoined twins. Fortunately, Dr. Marshall happened to be an expert in the one method that would definitively tell whether the children were twins or not: ancient DNA analysis. Because mitochondrial DNA is maternally inherited, siblings (and twins) MUST have the same mitochondrial sequence. Both children, despite having been dead for nearly a thousand years, had ancient DNA still preserved. By extracting the DNA and sequencing it, Dr. Marshall was able to determine their mitochondrial lineages (haplogroups). [I give a little bit of background into how ancient DNA research is done here and here]. Surprisingly, they were different! In the table below, you can see the mutated DNA base positions for each child listed in the third column (under ‘haplotype’). The particular combination of mutations for each child means that they belonged to two different haplogroups: A and C.
Marshall et al. 2011, Table 3. Therefore, the “conjoined twins” were neither twins nor siblings, nor maternal relatives of any kind. Black’s 70 year old hypothesis was wrong. Why were they buried in such a peculiar way? Dr. Marshall and her colleagues (Cook et al., 2012)*** presented a paper last year at the Midwest Archaeological Conference in which they discussed possible interpretations for this burial practice. Perhaps, they suggest, the children were non-maternal relatives (maybe half-siblings who shared a father? ), who died at the same time and were buried together to reflect this close relationship. Or perhaps the arrangement of the babies’ bodies was entirely symbolic. Twins play a special role in Eastern Native American iconography, and different Native American societies treat twins in different ways; in some cases they are regarded as having special spiritual power, in other ancient societies they were thought to be negative. Perhaps the co-burial of two maternally un-related children of the same age was meant to be symbolic of twinship, rather than having a literal meaning. In general, co-burial of individuals was a pretty common practice among the ancient Mississippians, and typically archaeologists have interpreted the co-buried individuals as being related to each other. However, those of us doing ancient DNA research in the Midwest have been testing this hypothesis on co-burials and finding that they’re almost never maternally related. Because no ancient Y-chromosome DNA has yet been recovered from Midwestern co-burials, we don’t know if they might be paternally related. The motivation for Mississippians to bury people together, and these two children at Angel Mounds in particular, continues to be a mystery. However, the approach of Dr. Marshall and colleagues is a very good example of how persistent research can disprove a long-standing, wrong hypothesis. It may be that future generations of students will be able to solve this mystery with additional genetic evidence. *The more popular term, “Siamese twins”, was introduced by P.T. Barnum to refer to Eng and Chang Bunker (http://en.wikipedia.org/wiki/Chang_and_Eng_Bunker), who were members of his circus. “Siamese twins” has therefore taken on negative connotations associated with this history. **Marshall C, Tench PA, Cook, DC, Kaestle FA. 2011. Conjoined twins at Angel Mounds? An ancient DNA perspective. American Journal of Physical Anthropology 146: 138-142.